Pulsar Products PWP20 2" Water Full Load, 2-Inch Pump | Fountain City Art Ctr. You need to drain the swamp, pond, pool, basement, whatever. 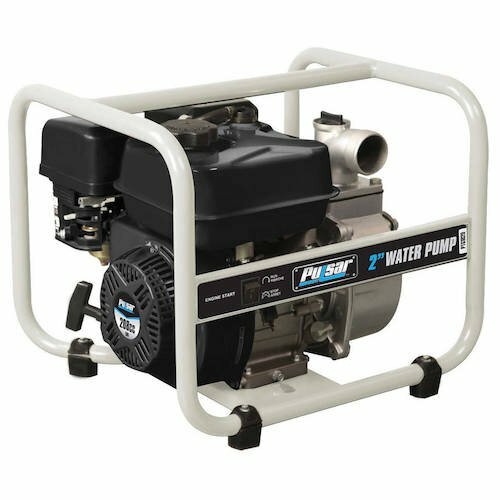 To do this, you need a good quality water pump capable of handling the job and nothing does a better job for the money than the Pulsar PWP-20 two-inch, semi-trash pump. Incorporating a cast iron impeller inside an aluminum volute, that is matched to a powerful 208cc, OHC four-cycle engine the PWP-20 provides a maximum flow of 38 cubic meters per hour with a total head lift of 32 meters, where head lift represents the distance from the point where the water enters the suction hose to the end of the discharge hose representing the distance one can "move" the water. Another critical consideration is suction height which represents the height or depth water can be moved. With its powerful engine and strong pump, the Pulsar PWP-20 creates a suction height of 7.5 meters. This allows for either deep draining clear, slightly muddy or sandy water and discharge the water to a higher elevation if needed. Designed as a semi-trash pump, the PWP-20 is capable of handling debris up to 17.65mm in diameter without damage to the impeller. To do this, water in the Pulsar unit traverses up the intake hose and into the volute where it enters the casing near the center of the impeller where pressure is lowest. As the Pulsar impeller spins at up to 3600 RPM's, the water is dispersed out to the impeller vane tips where pressure is the highest creating both suction and discharge pressure. While it sounds simple, the right combination of capacity, head lift and suction height makes the Pulsar PWP-20 a great way "drain the swamp".